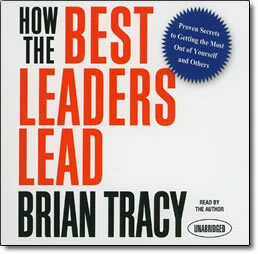 How the Best Leaders Lead – by Brian Tracy – CDs or MP3 – Discount! The world’s great business leaders make it all look easy because they keep it simple: measurable, repeatable methods that generate exceptional results in both strong markets and weak, good economies and bad. How do you master these responsibilities? First, you must ask yourself, “How well do I know myself and what do I truly want in my work and my life?” How the Best Leaders Lead will take you through a thorough self-analysis with which you will discover what is truly important to you—and identify the specific steps you must take to achieve it. You’ll then listen Tracy’s life-changing lessons culled from the leading edges of business, the annals of history and military strategy, and the wisdom of the world’s most powerful leadership and management thinkers past and present. Leadership is an exact science but a simple one, born of clear vision and courage, self -knowledge and integrity, focus and confidence. With acute insight and Brian Tracy’s quintessentially accessible guidance, How the Best Leaders Lead, brings those powerful attributes and leadership greatness easily within your reach.